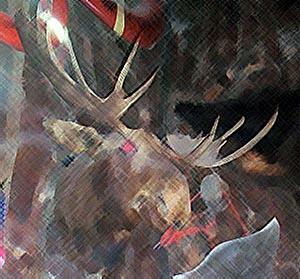 Behavior: The moose is an herbivore (a plant-eater) who spends most of the day eating. Moose eat willow, birch, and aspen twigs, horsetail, sedges, roots, pond weeds, and grasses. Other than the dewlap, I really can't relate to moose. 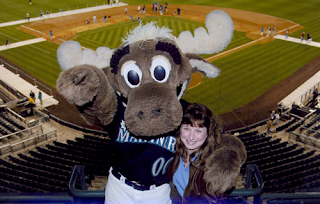 I've never really understood why the Seattle Mariners' mascot is the Mariners Moose, either. The name moose, given by the Algonquin, a native North American tribe, means "eater of twigs", reflecting the animal's primary diet of leaves and twigs. I dare you to relate that to baseball. The Manitoba Moose hockey team makes a bit more sense, because bull moose are known to be pretty aggressive (perhaps because they eat so many twigs). Of course they also sometimes get crushes on milk cows (which seems pretty odd to me unless you live in Montana). I also don't really understand why there would be a fraternal organization (that now includes women [the women of the moose] which I suppose makes it a fraternal/maternal organization) called the Loyal Order of Moose. Perhaps my dewlap also qualifies me to be a member. And this is not to say that there is anything wrong with being a moose, animal or lodge member. So don't send me any nasty e-mails about it. And why is New Hampshire, a state with the motto, "Live free or die" issuing license plates with moose on them. Since when does a moose symbolize freedom? Why is there a Web site called www.goMoose.com which claims to be a one stop place to get moose information (though it appears to be a blatant ploy to promote New Hampshire and their moose license plates)? Any of various chilled desserts made with flavored whipped cream, gelatin, and eggs: chocolate mousse. A molded dish containing meat, fish, or shellfish combined with whipped cream and gelatin (great with Ritz crackers). An aerosol foam used to control and style the hair (though I prefer gel). Why is it pronounced the same way as "moose?" Okay, I seemed to have raised more questions about moose than I've answered, but if you've stayed with me this time, you realize by now that I've simply been wasting your time. But isn't that what blogging is all about?